I'll be gone for a week for my annual birthday escape - just to let all here know that there's no one watching the store. My partner in Drawger, Josh Carpenter leaves as well for a tour with The Nein, where he'll be playing at South by Southwest on March 18th. I'll be checking email. As if anyone could possibly be interested - I'll be staying in the states this year, traveling down to Tampa Florida for some Yankee's spring training games and to visit the Dali Museum. No need to explain Yankee spring training, but the Dali Museum trip is a major enterprise for me. Two years back on another birthday escape, I was in Barcelona and a short train ride north to Figueres, took me to the home of another Dali Museum - which is a mind-expanding experience. 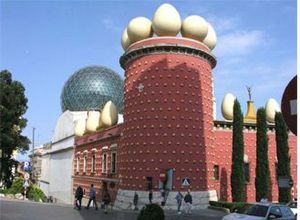 Figueres, by the way is also home to the Toy Museum of Catalunya. - do check the site out and explore some of their uniquely disturbing Flash animations. This animated oddity from the Toy Museum of Catalunya is a good example of how these people think.